BRYAN EATON/Staff photo. 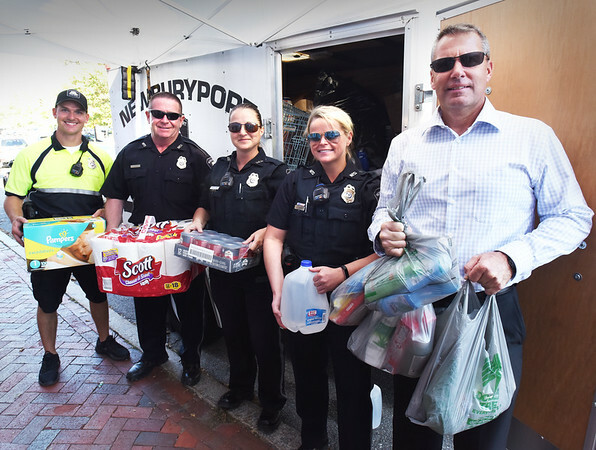 Just as Newburyport police officers involved in a drive to collect goods for victims of Hurrican Irma, someone stopped and handed several bags to Marshall Mark Murray who was standing off camera. Officers involved in helping to fill the van in back and part of the garage with goods, from left, Kyle McElroy, Ron Senter, Dani Sinclair, Tori Smith and Murray. Missing from photo is Rob Vatcher.